I’d like to dedicated this post to my freezer, for making this 3 Minute Dairy-free Mango Soft Serve possible. Who knew that frozen mango and bananas blended together could be so refreshing and so satisfying? With just a splash of coconut milk soften things up, this Dairy-free Mango Soft Serve is making all of my summer dreams come true. So if you have literally 3 minutes and a high-powered blender, you too can be enjoying this Dairy-free Mango Soft Serve as much as I am! When I’m not eating this straight out of the blender, I scoop it into a bowl and top it with shredded coconut or fresh strawberries. If I’m feeling super fancy, I’ll pour the Dairy-free Mango Soft Serve into a bag and freeze it for about twenty minutes. Then I cut the tip off the bag and pipe the creamy, tropical delight into a vegan ice cream cone. In a high-powered blender, blend all ingredients until smooth and creamy. Chow down and feel good! 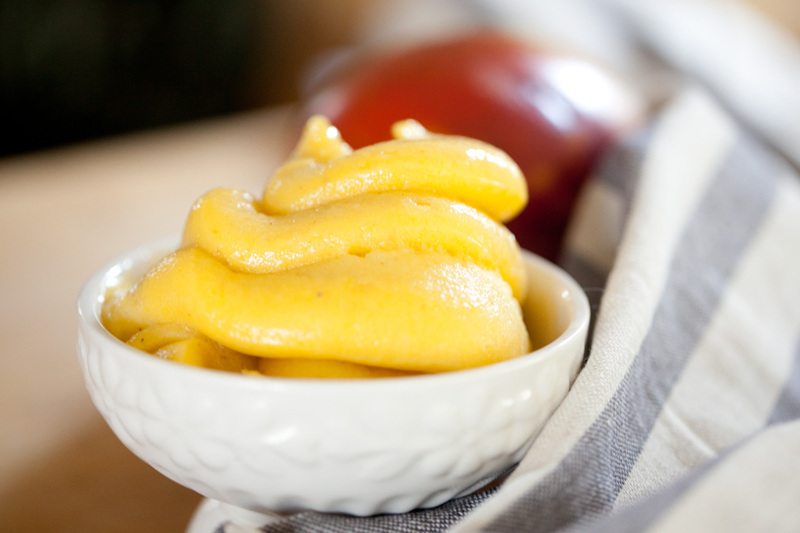 This Dairy-free Mango Soft-Serve is healthy! If you love simple, delicious desserts that are actually good for you, check out our Vegan Strawberry Ice Cream with Balsamic Glaze or our Raw Vegan Strawberry Cheesecake! To save this recipe for later, pin the photo below!